I made a new game! Well, maybe it's really more like an activity, a really fun activity where stars, factoring, combinations and geometry are all rolled up into one very beautiful package. My seven year old and I both learned a lot in this first round of what I hope will be a very fruitful inquiry into stars and their use in elementary math learning. This whole activity is thanks to some recent interactions I've had with Paul Salomon of Math Munch and Lost in Recursion. A couple days ago, Paul posted a photo of some amazing stars he designed and manufactured himself, using a laser cutter to and 1/4" plexiglass. Aren't they cool? 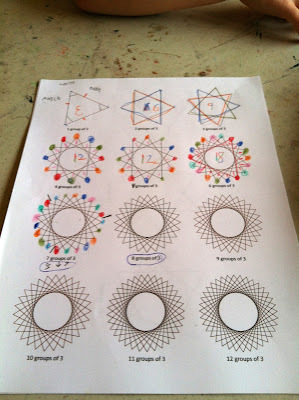 "The top row is every possible 12-pointed star. The bottom row is the cutout dodecagon that fits in the middle. Starting on the right we have a dodecagon (every line goes over one corner); then on the next one 2 hexagons (lines go over two corners); then 3 squares (lines go over 3); then 4 triangles (lines go over 4); then a single-pieced 12-pointed star (go over 5); then a a 6-line asterisk (lines go over 6). Make sense?" "Geometry yes, but it also has connections to number theory. If you do this with 13 points, for example, every star comes in one piece (nothing like 3 squares), and that's because 13 is prime! It's a cool question to work on. If I have 10 points and I go over 4 points, how many pieces will I end up with? Images like this also come up in group theory, a branch of modern abstract algebra. Paul's patient explanation included a link to Vi Hart's video on doodling stars which was really helpful and a very cool star applet for playing around with different permutations (or is that combinations?) of points and lines. As always, I started thinking about how my daughter and I could explore these ideas together. I have my own inquiry separate from hers, but it always seems to come back to one question: How can I use this new information with a seven year old in a way that is mathematically meaningful? Me: We're going to do something with the number three. There are three of one thing that we're going to add to another three and see what it looks like then. Sort of like multiplication. Kid: I already know how to do that. Me: I know, but this is a new and different way to think about it all plus we can use your new colored pencils! So, let's look at this first triangle. What can you find three of? She quickly found each point/corner, which she spontaneously marked with blue colored pencil, a move that completely influenced the way I guided the lesson from that point on. I've used geometry words with her in the past and I asked if she remembered the word for what we were calling a corner. She didn't so I had her write down the word vertex. Then I wondered if she could find something else there was three of in the triangle. She took her orange pencil and marked the sides, and then I had her write down the word 'edge'. I thought we were done, but she suddenly found the interior angles and marked them with a pencil. Awesome. On the second star I said, "Now we're going to see what happens when two of the same triangles are put together. What do you notice?" She started counting individual points and found there were six. To clarify the 'groups of three' I asked her to find one triangle to trace -- it took a minute but she finally figured it out and, after that she quickly found the second triangle which she traced out in blue. Me: So, since there are now two triangles, we have two groups of three. How much is that all together? She wrote down the number six inside the star using both the blue and orange which I was pretty happy to see. I would have never even thought to prompt her in that direction, but it was a clear indication that she understood the number was a combination of two different numbers. 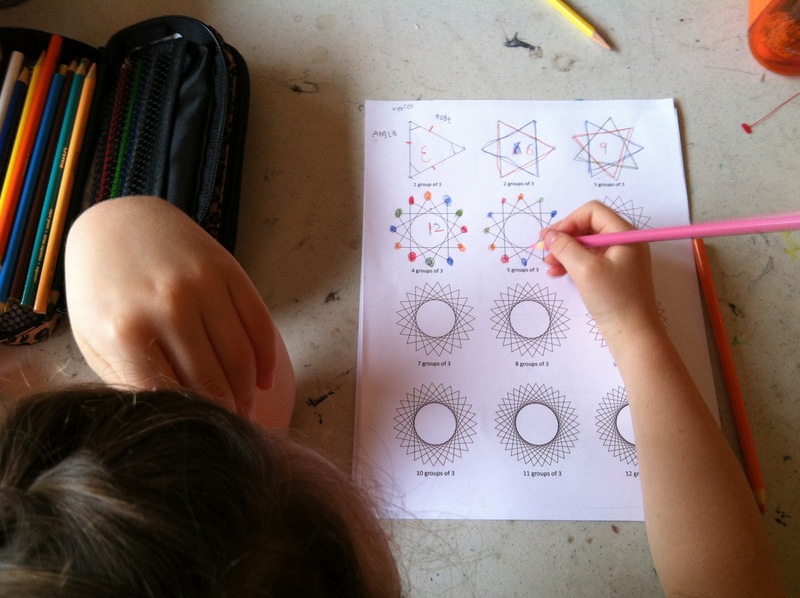 As you'll notice, she continued this practice all the way through the 18 pointed star. Kid: Hey, wait a minute, this one is the same as the other one! She started making marks while she counted the points and, sure enough, it was the same star twice. It felt like the perfect imperfection for this lesson. I always love it when kids discover anomalies or mistakes. It means they're really paying attention. By the time we got to the 18 star she exclaimed: "All these stars are making my head hurt!" but I encouraged her to persevere. After she found the first triangle (with the pink dots) I asked her if she knew enough now to predict the placement of each consecutive color. She put down the orange and right away saw that, if you go in the same direction (in this case counter clockwise) three dots of a new color always go counter clockwise to the previous color. Even though I had said we could be done after the 18 star, we did get to the 21 star and it's good we did because I got to make another interesting mistake. For this last star I wanted to show her a different color pattern I had noticed. Since the previous star (18) needed six colors to highlight each individual triangle, I had her pick one more color for a total of seven. Then I asked her to see what would happen if she just put down one color at a time in a sequence until she had used all seven colors. All was going smoothly -- she put down seven colored dots on the points starting with light blue, and I drew two little lines to show where the seven started and ended. Then she repeated the same pattern (this time she went clockwise, I think) two more times. It was at that point that I realized something was amiss; that we had visually shown three groups of seven instead of seven groups of three which was one of the main goals of this lesson. A minor point, but one made much more obvious using the colors, and a result I am still puzzling over. I think my pictures tell a pretty good story, but in the moment there was some major flow happening. The colors are not just beautiful visual additions to the designs but also really effective in illustrating the structure, combinations and multiples within the stars. Overall, I'm pretty proud of myself for setting up and guiding this little exploration, but I would love (love!) to hear your feedback on this activity and any ideas you have on what we could do next. Malke Rosenfeld delights in creating rich environments in which children and their adults can explore, make, play, and talk math based on their own questions and inclinations. Her upcoming book, Math on the Move: Engaging Students in Whole Body Learning, will be published by Heinemann in Fall 2016. "... we had visually shown three groups of seven instead of seven groups of three ... a result I am still puzzling over." A group of 7 was a rainbow sequence. A group of three is the three dots of the same color that form a triangle. Right? So you can 'see' the same thing two ways. Sue, maybe it's just harder to see the seven groups of three because they're so spread out? I guess my point was I switched gears mid-way through -- instead of focusing on 3's I focused on the number of colored pencils she needed and predicting the pattern. After all I've read about multiplication being about groups of things, I can't imagine that there were really 'three groups of seven' in that design, or if there was what they would be exactly. so you have 7 groups of angle a's, 7 groups of angle b's and 7 of angle c's? Great stuff, Malke. I quite love that you switched to thinking about the seven instead of the three. Makes perfect sense. The whole process helps make the connection between seeing the 3s in the (6,2) star [thats the number of points and jump number notation] and the 7s n the (21,7). It's this ability to flip back and forth that makes it easy to snap between multiplication facts and division, in the future say. Excellent activity. Thank you for sharing. Can't wait to share this with my nephews. Hiya! Does the frequency of updating your website depend on something or you compose articles when you have a specific mood or free time on that? Thank you so much in advance for your reply.